For now there are no honey bees in the hives. 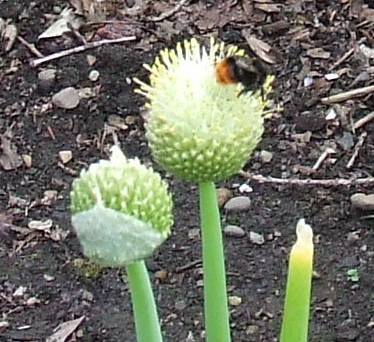 Instead you will see bumble bees, mason bees and solitary bees feeding on the flowers of the walled garden. 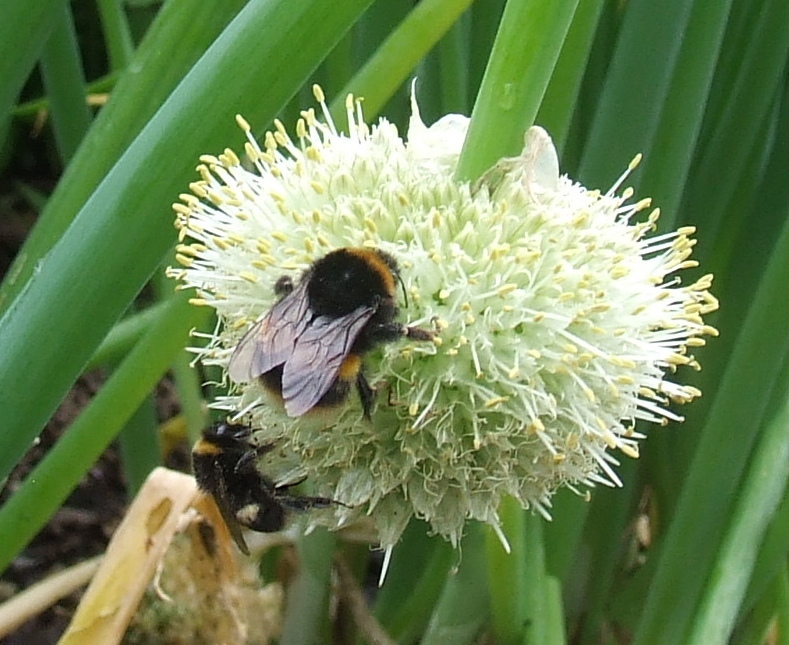 The latest news from the BumbleBee Conservation Trust tells us how bees have fared during the spell of weird weather we have experienced over the last 12 months. Coldest spring in 50 years! Following on from the wettest summer in 2012 since records began, bumblebees have been hit again by the slowest start to spring in recent times. Although temperatures were lower than average in both April and May, March was the coldest since 1962. The average temperature of 2.2°C in March was a full 3.3°C below the long term average, according to the Met Office. 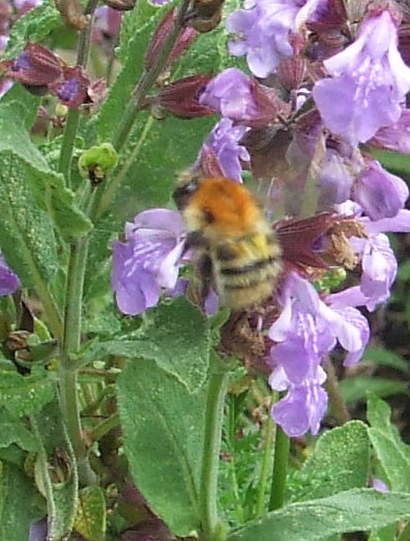 This has had a huge effect on bumblebees and their usual life-cycle. During a warm spell in February and the very beginning of March, the first Queens emerged from hibernation. Very soon freezing temperatures left us struggling to see bumblebees again until the weather broke about mid-April! Thankfully bumblebee queens have the ability to re-enter hibernation when conditions change dramatically. The bumblebee life-cycle could now be between one to two month’s behind depending on location and species. Records for Tree bumblebees started to trickle through to BeeWatch towards the end of May, compared to last year when they were at their peak at this time. 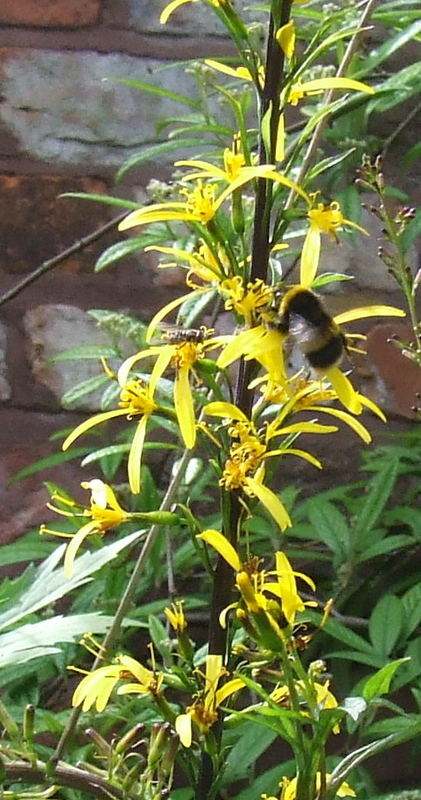 Similarly Early bumblebee males should be plentiful now. Although the first record was added to BeeWatch on the 5th of May, further records accumulated slowly. Just in the last week or two, the bumblebee season seems to have finally got underway with lots more records of Tree bees, Early males and new cuckoo queens. As the bumblebee season is finally hotting up, you should start to see more males and even male and female cuckoos if you are lucky! Males can be distinguished by their longer antennae, thinner hind legs as they don’t possess pollen baskets and general fluffy appearance. Males of four of our common species, very helpfully, also possess extra yellow banding and yellow moustaches! Three of these species are shown below. The Heath bumblebee (Bombus jonellus) is missing. Cuckoo bumblebees are much stronger and tougher than our social species and use this strength to overpower and often kill the queen in her nest. They are therefore longer, have dark wings, have hairy hind legs as they don’t possess pollen baskets and their fur is much more sparce and scruffy in appearance. Kirkwood and Little Wood have both been designated as SBIs. They are sites of biological importance. The presence of indicator species such as Dog’s Mercury tell us that this area has been woodland for many centuries. During that time the composition and the structure has changed. For centuries it seems likely that they would have been dominated by oak trees. Place names locally are reminders of that: Oakwood Hall, Oakwood Mill. In the past, oaks have been felled for timber. Instead of more oaks, beech trees were planted. Why beech trees ? They grow faster and can be cropped earlier. However, while they do support wildlife, the ecosystem can be less diverse than an Oak Woodland. As a result, the management of Kirkwood involves active intervention to increase the possibilities for an extended range of plants and animals. 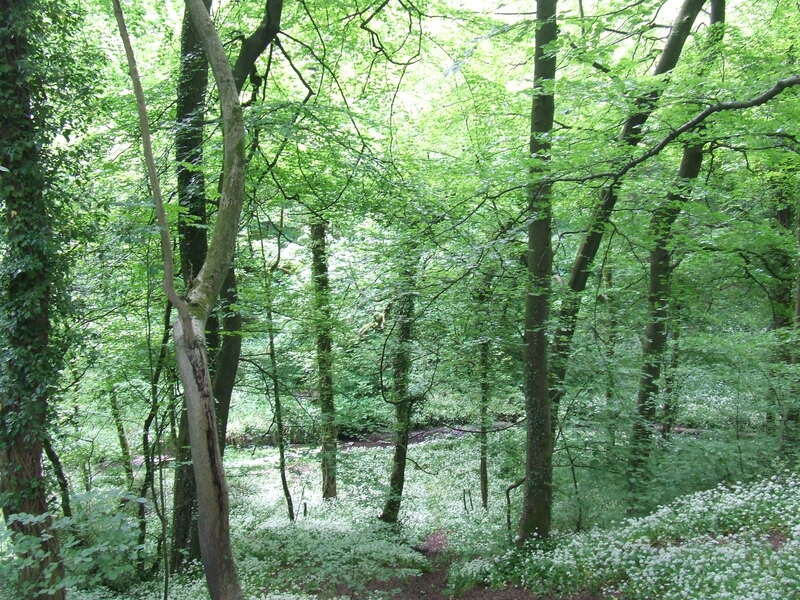 The current management plan has attracted grants from the Forestry Commission. Visitors can see evidence of the work being done throughout Kirkwood. 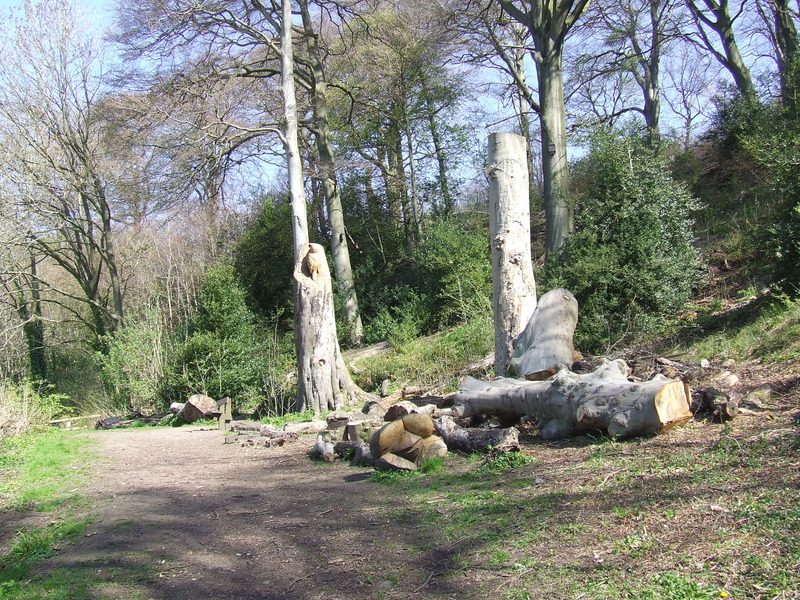 By the walled garden, the felled beech tree is part of a strategy to increase biodiversity. Overlooking the Walled Garden, a Beech tree has been felled. The standing stump and the logs around it’s base will provide a microhabitat for a range of plants and animals. Over time the wood will rot. Fungi will germinate and spread contributing to the decomposition and decay. Beetles will make their homes in any crevasses that develop. To give this process a helping hand and accelerate colonisation, cuts have been made into the stump with a chain saw. Starter homes. Beetles attract birds. They will forage among the stumps for food. Stumps, rotting wood and the beetles, all part of the mix for a woodland rich in wildlife. This woodland ecosystem provides a valuable habitat for birds. Some are resident, others passing through; siskins feed here, blackcaps breed. Mandarin ducks nest high in the branches. Flocks of hirondelles 60 strong swirl above the river feeding. Healthy plants. Excellent value. Interesting varieties. 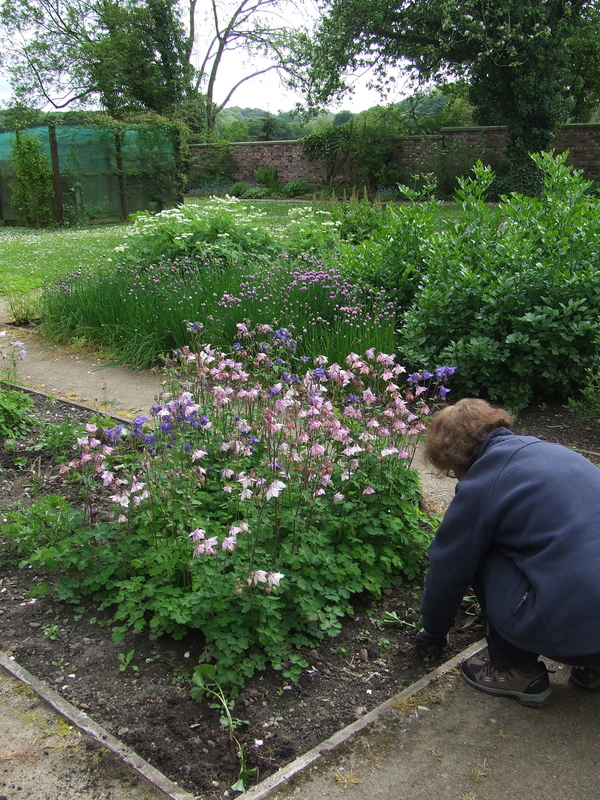 All proceeds from the Friends of Chadkirk Stall to support the planting in the Walled Garden. A percentage of takings from Kim’s Cottage Garden Plants donated to the Friends of Chadkirk funds and used on projects in and around Chadkirk Chapel and Walled Garden. 1st June. The Met Office forecast fine weather with blue skies and sunshine. Despite a cool breeze from the northwest, down at Chadkirk there’s shelter in the Walled Garden and it is a pleasant day to tend the soil. 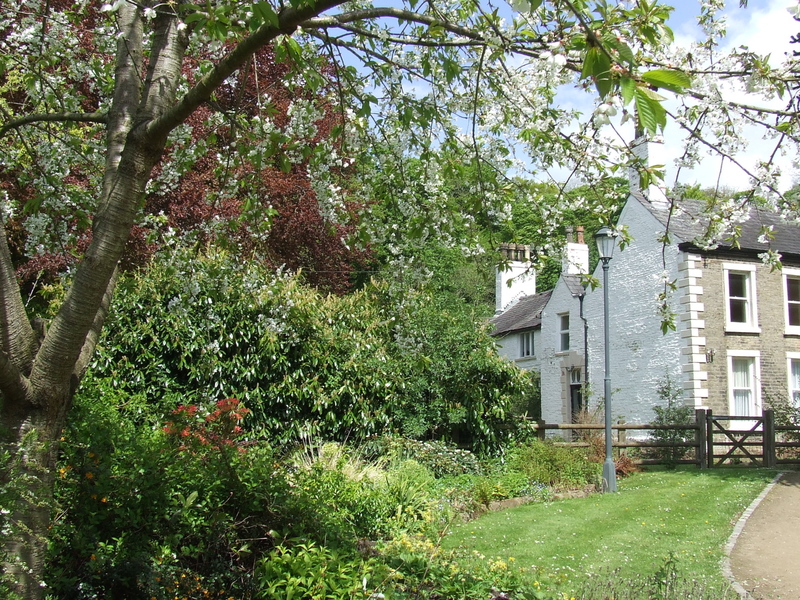 There’s gentle work for volunteers who care for the garden. 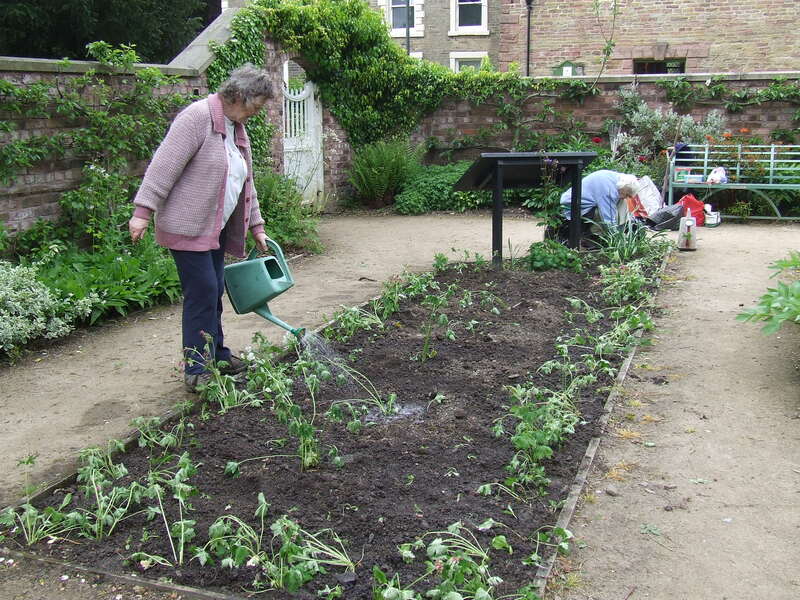 On Saturday, Friends of Chadkirk gave their attention to replanting some of the herb beds. Two of these beds had been planted with box, which became blighted by a virus. On an earlier gardening afternoon affected plants were removed. Re-planting with box is not an option as the virus is present in the soil; instead cuttings of geraniums and geum rivale have been used. They will be quick to get established and provide attractive ground cover as a temporary infill. In time the box may be replaced with ilex or lonicera. These plants have a similar impact in the garden. They look a lot like box. But they are unaffected by the virus. The volunteers are looking to source plenty of cuttings for the next phase of planting. In the meantime, Pat will visit daily and water the plants propogated from her garden. By the time of the festival, the new plants will be thriving. The Met Office is still doing the calculations.However it seems likely that they’ll soon confirm what many of us know in our bones: it’s been the coolest spring in England since 1961. And the cool and wet May has for some of us meant that we have not been able to enjoy our gardens as much as we might like. Nevertheless there are some consolations. Few would dispute the beauty of the blossom, now it’s here. The apple trees in the walled garden are a delight, blushing with effervescent blooms. 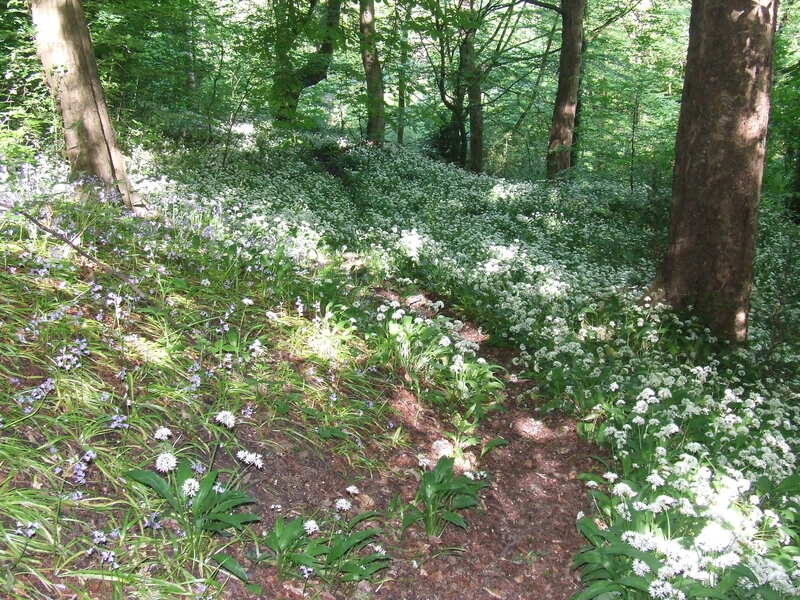 Out in the woods, it may be June but you can still enjoy the carpets of bluebells on the slopes of Kirk Wood. 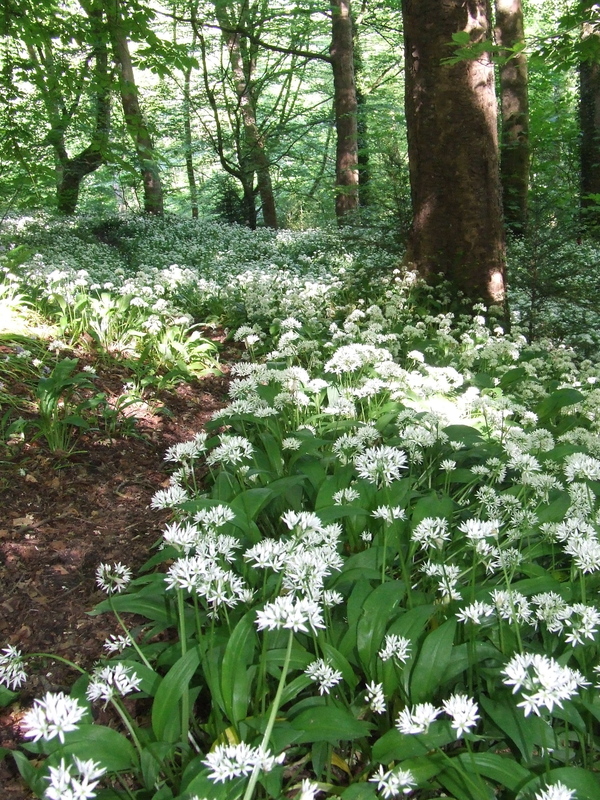 Perhaps most impressive are the drifts of wild garlic. On a warmish humid afternoon, you can taste the pungent oils as their spicy scent hangs heavy. 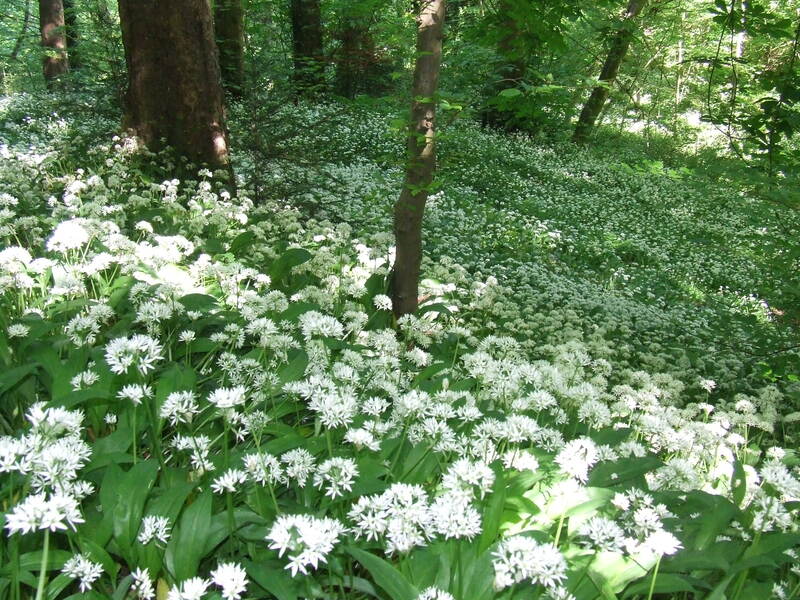 The woodland floor white and green, radiant in the gentle light filtering through the fresh greens of late spring.